One of the last free zoos in the United States, Como is home to a wide array of animals and plants and welcomes visitors 365 days a year. Located next to Como Town Amusement Park, the historic Cafesjian's Carousel, and in Como Park, the zoo and conservatory are great fun for visitors of all ages. The Bullard Rainforest Auditorium has a fabulous view of the bird yard and can seat up to 200 guests for a sit down dinner and 300 for a reception. 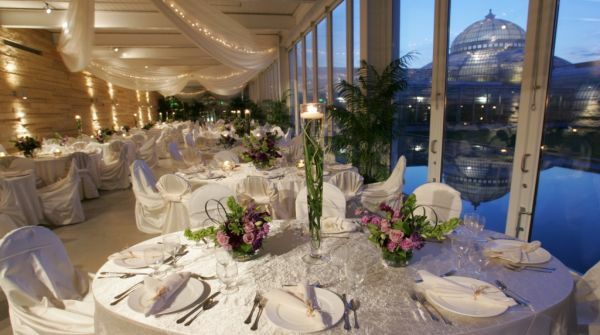 Included with the auditorium space is a foyer with floor to ceiling windows and a lovely outdoor terrace overlooking the Marjorie McNeely Conservatory. The Covered Porch is a long, modern-looking space that is bordered on one side by stone and romantic sconce lighting. The other side is all glass and provides a magnificent view of the Marjorie McNeely Conservatory. The Porch is bordered by a long reflection pond and a large lawn. The Covered Porch can seat up to 250 guests for a sit down dinner and 400 for a reception. The Enchanted Garden is a large grassy area, across the street from the Conservatory and adjacent to Como’s Enchanted Butterfly Garden. It can accommodate up to 250 for a ceremony and is rented for a four hour time slot. Rental rates are $550 for a 4 hour block of time on a Saturday, $500 on a Friday or Sunday and $400 during the week. $150 for each additional hour or $900 for an all day rental. This fee does not include chair rental. You may choose to rent a tent for the ceremony; in this case a full day rental is required. Chair and tent rental can be arranged by Como. The Enchanted Garden is available to rent between 7:00 am – 7:00 pm. The Polar Bear Lodge provides a great get-away for business meetings, education classes and private receptions. The lodge has a cozy fireplace, 42-inch LCD screen, Smart Board, and floor to ceiling windows looking out into Polar Bear Odyssey. It accommodates 40 people in theater-style seating, 50 for a cocktail reception, and 30 for a sit down dinner. The South Patio, adjacent to the Visitor Center can accommodate up to 250 people. It is available during the summer months between 6:30 –8:00 pm for $400, not including chair rental or decorating costs. The Donor Plaza is located between the historic zoo building and the water bird exhibit. It can accommodate up to 200 people, not including chair rental. This space may be rented between 6:30 – 8:00 pm. The Sunken Garden is a year round formal indoor flower garden that can accommodate 90 people, standing. The fee for a 90 minute rental on a Monday through Thursday is $650, Friday and Sunday is $950 and Saturday is $1000. Rental times April through September are 8:15am-9:45am, 6:30pm-8pm and 8:30pm-10pm. October through March are 8:15am-9:45am, 4:30pm-6:00pm, 6:30pm-8:00pm and 8:30pm-10pm. The Japanese Garden is a serene outdoor garden available May 1st through September 30th. It can accommodate 30-35, people standing. The fee for a 60 minute rental Wednesday and Thursday is $500, Friday and Sunday is $550 and Saturday is $600. Rentals times May through September are 8:30am to 9:30am and 6:30pm-7:30pm. The North Garden is a year round indoor tropical garden featuring fruit, nut and spice trees. It can accommodate 30-35 people, standing. The fee for a 90 minute rental Monday through Thursday is $350, Friday and Sunday is $700 and Saturday is $750. Rental times April through September are 8:15am-9:45am, 6:30pm-8pm and 8:30pm-10pm. October through March are 8:15am-9:45am, 4:30pm-6:00pm, 6:30pm-8:00pm and 8:30pm-10pm. The Excedra is an outdoor garden across the street from the Conservatory available May 1st through September 30th. It can accommodate around 50 guests. This garden is available any day of the week 7am to 7pm. Weekdays are $300 per hour, Fridays and Sundays are $400 and Saturdays are $450.